On December 11th 2006, our lives changed forever, Spencer had been complaining of tummy ache for the previous two nights, as it was most unusual of him to be ill, I decided to take him to our Doctors for a check up. I managed to get an appointment straight away and it soon became apparent that this was more than just a tummy bug! The Doctor immediately transferred us to the Royal Alexander Children’s Hospital in Brighton for further investigations and this was when the true nightmare began! As time went on, he was given various scans and x-rays and you could tell that the consultants investigating were becoming more senior as the day wore on! Eventually the same afternoon the consultants gathered round and gave us the devastating news – Spencer had cancer, there was a possibility that it was either Wilms or Neuroblastoma, but they did say they thought it was Neuroblastoma! I can recall to this day that I said “that is good then” and everybody just looked around with grief etched on their faces – I knew then that it was indeed very bad news. We stayed in Brighton hospital overnight and the next morning, Spencer was so seriously ill that an ambulance took us straight to Marsden with the sirens going and flashing lights on. 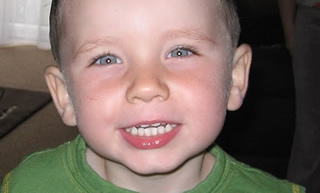 It was confirmed that Spencer had neuroblastoma and the disease was widespread. The main tumour was very large and was attached to his left adrenal gland; it had also spread to his lymphatic glands in his neck. We spent most of 2007 in and out of various hospitals across Brighton and London, more time in than out! Spencer has undergone various treatments, all very hard and pretty horrific. Spencer was admitted to St Georges Hospital, Tooting, where he went for his first general anaesthetic: they took a biopsy of the tumour and also checked his bone marrow. He had a central line (Hickman line) fitted so they could administer his drugs throughout forthcoming treatments without having to keep inserting needles in him. Surgery was carried out at St Georges Hospital: the surgery lasting eight, nail biting stressful hours, but was very successful. We spent nine days here, two of these with Spencer in intensive care. Unfortunately, as always throughout Spencer’s treatment – things didn’t go to plan and it took seven attempts to try and obtain enough bone marrow for his transplant, in the end they decided to go with what they managed to obtain, but it was below the minimum level, however after so many attempts they decided they had to go with it. Throughout high dose he contracted a virus and ended up in isolation at the Royal Marsden for seven long weeks. We also had another stay in intensive care as his organs began to fail, but fortunately he soon recovered. This involved travelling daily to the Royal Marsden for three weeks. He went under a general anaesthetic everyday for radiotherapy which lasted twenty minutes. Unfortunately on November 27th 2007 Spencer was feeling poorly and admitted to Brighton Hospital, regrettably the cancer had returned and there was no cure. Even Spencer must have known, because he turned to us and pleaded "no more needles, Mummy and Daddy". We came home with Spencer on Friday 7th December, we were told that he would not have long to live, as the cancer was so aggressive. He is our brave little monkey and will be forever in our hearts.